Peaches—luscious, sweetly aromatic and delicious—are arguably the perfect fruit. It’s little wonder we use the word "peachy" to describe something being just right. In China, where peaches originated and still grow wild, the fruit has long been a symbol of happiness, riches and longevity. Not surprisingly, China leads the world in commercial peach production today, followed by Italy and the United States. Peach festivals pepper the states where peaches are grown, including California, South Carolina, Georgia, Pennsylvania and New Jersey. Georgia, the "Peach State," rings in the New Year with an annual Peach Drop, where an 8,000-pound peach (made of fiberglass and foam) drops at midnight in Atlanta. And the world's largest peach cobbler is concocted each year at the Georgia Peach Festival in Fort Valley. The sweet concoction is 11 by 5 feet and 8 inches deep, and calls for 75 gallons of peaches. Peaches are a good source of vitamin C. They also provide dietary fiber, vitamin A, niacin, potassium, fluoride and iron. A member of the rose family, the peach is a "drupe," or fruit with a hard stone. Depending on how the fruit attaches to that central pit, peaches are classified as "freestone" or "cling." Freestone peaches are sold for eating out of hand, and cling peaches are used for jams, canning and cooking. And yes, nectarines are related—they're peach cultivars with smooth, rather than fuzzy, skin. Among the hundreds of peach cultivars, popular varieties include: Flavorcrest, Flavorich, Ryan Sun, Last Chance, Sweet Dream, Spring Snow, Blushingstar, Golden Princess, Sierra Rich and Springflame. While yellow-fleshed peaches are the most popular type in the United States and Europe, white-fleshed peaches are most popular in China. 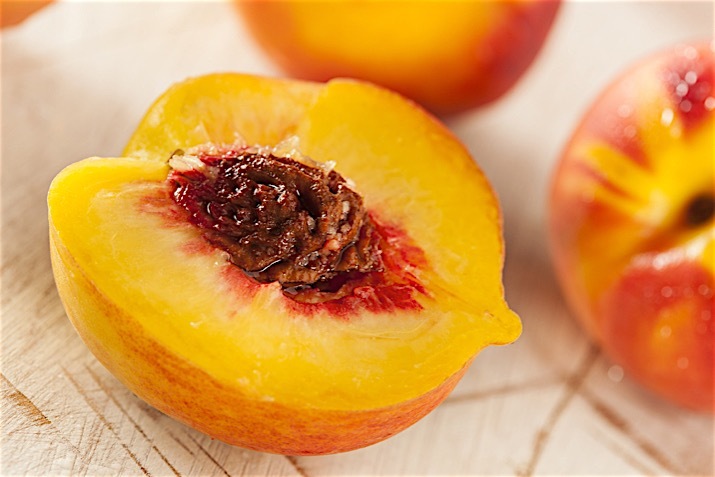 White-fleshed peaches are sweeter than yellow; yellow peaches have a bit of a tang. Donut peaches are a flat, sweet cultivar with a white flesh. Biting into a fresh, juicy peach is a wonderful way to revel in the delights of seasonal summer produce. The fresh fruit is also delicious in smoothies and atop cereal and crepes. Combine peach slices or chunks with cherries, cantaloupe, melon, mango, passion fruit, plum, apricots, any berries and most tropical fruits for a stellar fruit salad. They'll also add color, delightful taste and visual interest to a leafy green salad topped with poppy seed dressing. Peaches make wonderful jams, preserves and butters and a unique fruit salsa, too, when combined with minced onion, cilantro, and a red jalapeño pepper—a perfect accompaniment to grilled chicken, fish or tofu. Speaking of grilling, it's a great way to bring out the sweetness of peaches. Here's a Grilled Peach and Prosciutto Salad that enlists peaches to enhance a salad of goat cheese, prosciutto, mixed greens and pistachios, all topped with a lively dressing. For more information on grilling summer fruit (and vegetables), see The Fruit and Veggie Grilling Guide. Peaches are a truly versatile dessert fruit. Whether you're stirring up a simple Homemade Peach Frozen Yogurt or a cake that highlights the fruit, such as this Peaches and Chantilly Cream recipe, peaches star when they take center stage. One traditional, delicious way to celebrate the arrival of peaches is in a crisp. Here's a festive, beyond-classic recipe for Peach Ginger Crisp made with both ground and crystallized ginger and maple syrup. When a recipe calls for fresh fruit, peaches are almost always a good bet. This Fruit-Topped Bread Pudding puts to use whatever bread and fruit you have on hand, for example—and peaches are perfect in it. By the way, if you're a bread pudding fan, don't miss this recipe for Blueberry Peach Bread Pudding with White Chocolate Sauce. Peaches are available from April through October. Look for peaches that are mildly fragrant and bright. They should be evenly colored, with no hint of green; if they're picked too soon they won't be as sweet and may not ripen nicely. The fruit should give a bit to your touch but not be too soft. Avoid fruit with soft/bruised spots. To ripen peaches that are hard, place them in a brown paper bag for a few days. Refrigeration can make peaches mealy, but if your peaches are approaching the too-soft stage, you can refrigerate them for a day or two. The best approach is to only purchase what you can soon use—which might be quite a lot of this perfect fruit.